The William Aaron Brandenburg Collection contains documents and items relating to the Kansas State Teachers College of Pittsburg, Kansas (now Pittsburg State University), particularly the years that Dr. Brandenburg was the president of the college, 1913-1940. 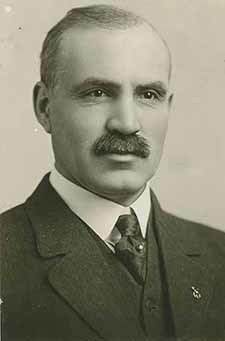 He was the first leader of the school to have the title of President, replacing the title of Principal. During his presidency Dr. Brandenburg added ten buildings to the campus, numerous programs and certificates, and increased the size of the faculty. The collection includes photographs, newspapers, items concerning both 20th and 25th anniversary celebrations, and biographical information. Letter to W. A. Brandenburg, Educator's Agency, Inc..
Are School Teachers as Valuable as Scrub Women? Money Talks! Poems to the Side, Marguerite Edwards. Otto Freund. Arthur L. Lippmann.